This blog post is my tribute to Alan Turing who was born on this day, exactly 100 years ago. As as computer engineer, I have learned about Turing in some of my first courses back at the university. In the 1930s, Dr. Turing introduced ground-breaking concepts such as the Turing Machine and the Turing Test. The Turing Machine is regarded as the grandfather of all computers while seeing the IBM Watson compete on Jeopardy last year has shown that we are not far away from passing the Turing Test. And let’s not forget Turing’s legendary contributions to cryptology in his role at the Bletchley Park while breaking the German Enigma codes during WW II. 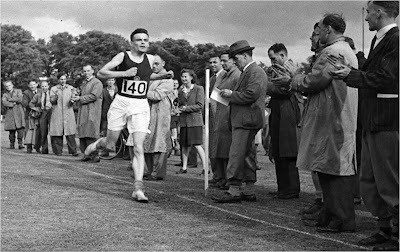 One less known fact are Turing’s accomplishments as an athlete. He was a competitive runner, starting for the Walton Athletic Club in Walton, Surrey. In 1947, he competed in the Amateur Athletic Association Championships marathon finishing in 4th place in 2 hours 46 minutes and 3 seconds. Folks, 2:46:03 is an amazing time for a non-professional runner even today. Back then, he was within some 11 minutes off Olympic gold medal pace. In fact, that pace is even faster than the marathon time Lance Armstrong posted in the 2007 New York City Marathon which he completed in 2:46:42. Clearly, Alan Turing was a remarkable person and we should celebrate his life and accomplishments - not just today. Turings Marathon time is extremely good! I first heard from Turing not in Computer Science classes but from Science Fiction with AI stuff in the story. I'm still fascinated by the Turing test and what this man has accomplished. One is about the first chess program that has been written - by Alan Turing! Thanks Andreas. I love the Turing Machine made out of Lego! The result is even more amazing considering that Alan Turing - most likely - didn't take any drugs to improve his performance. You are right about that, Steffen. I decided not to go there but the thought has crossed my mind when I was writing the article.